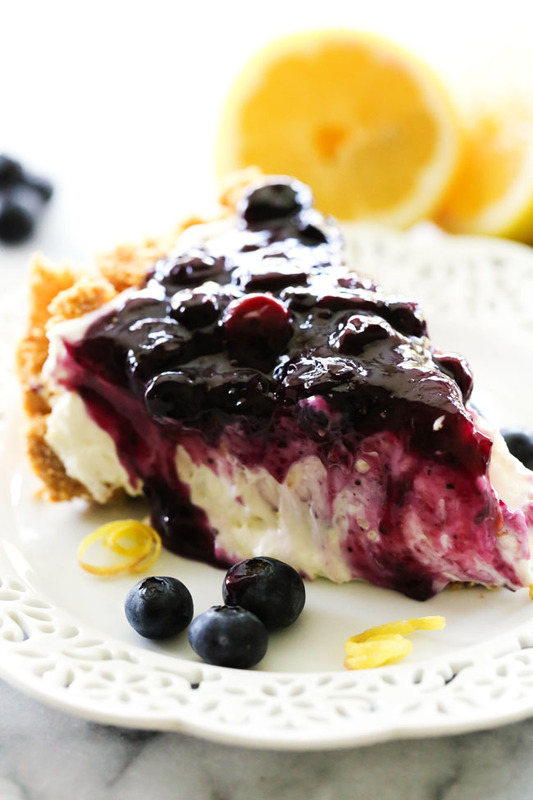 A delicious and fresh lemon cream pie in a homemade graham cracker crust and topped with the most delicious homemade blueberry sauce. This is a perfect summertime treat! I know I must have said it a thousand times, but I am IN LOVE with the lemon blueberry combo! It wasn’t too many years ago that I didn’t really care for lemon flavored things. People would call me crazy! Then I made these Lemon Cookies and they literally changed everything for me. Lemon quickly became one of my favorite ingredients in desserts. It provides such a fresh flavor to anything its in. This pie is absolutely perfect for summertime. 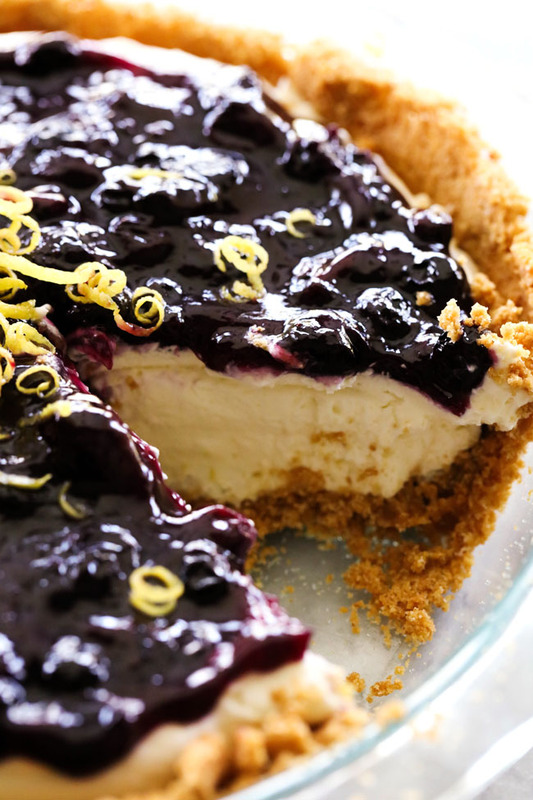 The Blueberry Sauce on top of the Lemon Cream filling and homemade Graham Cracker Crust creates perfection in each and every bite. 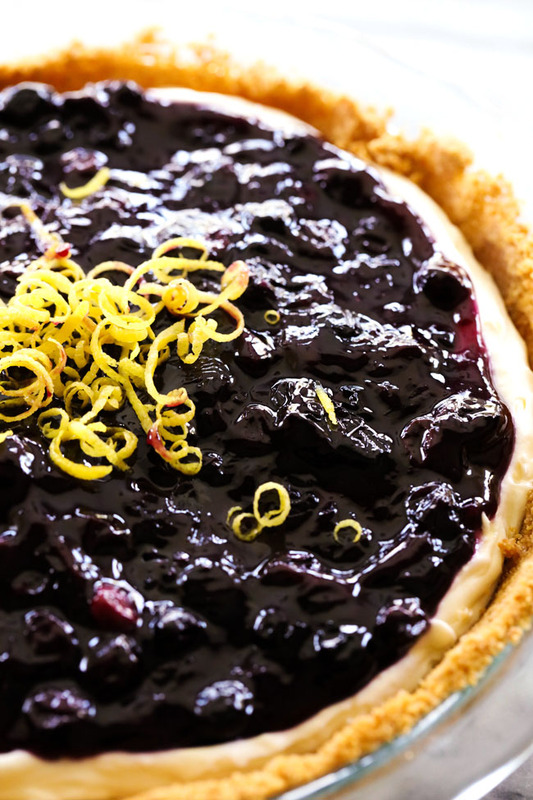 This Lemon Blueberry Cream Pie NEEDS to be on your summertime baking list! It will be a huge hit whoever it goes! Preheat oven to 375 degrees F. In a small bowl combine graham cracker crumbs and sugar and mix well. Add melted butter and mix until it is well blended. Press into a 9 inch pie pan and bake at 375 degrees F for 7 minutes. Cool completely. In a medium saucepan combine blueberries, water, sugar, cornstarch and lemon juice. Over medium heat, bring to a boil stirring constantly. Cook until thickened. This usually takes about 5 to 7 minutes. Cool completely. In a small mixing bowl, beat whipping cream stiff peaks form. Add softened cream cheese and sugar and beat until smooth. Beat in lemon zest and lemon juice. Pour cream cheese filling into cooled crust and spread evenly. Spoon cooled blueberry sauce over the top. You can garnish with lemon curls or lemon zest. Chill for 2 hours before serving. Such a pretty pie! You're right, lemons and blueberries make a great combo! So creamy! Looks amazing with the berries on top! This looks so good - love your recipes! Have to try this pie! Just wondering - for the Filling, when you say to beat the whipping cream, how long do you beat it? Is it supposed to have soft or5 stiff peaks? Thank you, I am a novice cook & not really sure about how to do this right. I'm wondering the same thing, Janet!? When I first made this pie the filling was quite running, even after 3 hours of refrigeration. BUT the good news is, that it was perfectly set up the next day. Just wanted to share this with you as you were wondering about beating the whipping cream. I didn't beat it for long - about one minute. I don't really know if you're supposed to beat the whipping cream until it starts to thicken. I didn't wait that long. It tastes amazing. I also doubled the amount of lemon juice in the Lemon Cream, but I like a strong lemon flavor. I have the same question. By the looks of the pie it's pretty soft. What I would do is whip the cream til stiff and set aside, beat the cream cheese then blend together. I'd also slowly add 1 Tb. gelatin dissolved in 1/4 cup of water. So sorry about the confusion. It is stiff peaks :) I updated the recipe to say so now. Thanks for catching that! Hi Fane! So sorry about the confusion. It is stiff peaks :) I updated the recipe to say so now. Thanks for catching that! But I am glad to hear yours still turned out and that you liked it! Thanks so much for the feedback :) I appreciate it and love hearing that! Hi Bonnie! So sorry about the confusion. It is stiff peaks :) I updated the recipe to say so now. Thanks for catching that! Yum! I love how gooey and creamy that pie looks! This sounds amazing and so simple! Does the whipping cream need to be beaten to soft or hard peaks before adding cream cheese and lemon ? My family and I LOVE LOVE LOVE this dessert, however, I couldn't get the Lemon Cream to set up. Just like Janet's question, I'm a bit confused about the directions regarding beating the whipping cream. Not sure how long I am supposed to beat it before adding the cream cheese. That may have been where I went wrong. Not sure?? Can anyone help me?? So sorry about the confusion. You beat until stiff peaks form :) I updated the recipe to say so now. Thanks for catching that! Looks awesome but beat whipping cream how long? Till soft peaks? Stiff? Any? Hi Patti :) So sorry about the confusion. It is stiff peaks :) I updated the recipe to say so now. Thanks for catching that! I'm dying over here...I just pinned at least 6 of your latest recipes in 3 minutes lol! Loving your blog. This recipe was easy and it was delicious. Everyone loved it! I mad this today and it was super delicious. I did however, add extra lemon juice because I needed a stronger lemon flavor. Thanks for a perfect summer dessert!! Hey! What kind of sugar, white ganulated or brown, did you use? This looks great! I made this pie for the annual pie contest and WON!! Many compliments on how good the pie was. Thank you for sharing. This sounds awesome. I'm going to make it for Memorial day. I'm a lemon fiend though. So I think I'll spread a thin layer of lemon curd over the crust before I put the lemon cream filling in. Made this for Memorial Day dessert today- subbed the graham cracker crust with an oat cookie dough crust (see momofuku crack pie recipe on Etsy for yummy crust idea). Taste blew my mind- light, creamy, and vibrant lemon and blueberry flavor. Best dessert of the year. I served it after an hour of refrigeration, and cream was not set, but still delish. Recommend it setting for 3-5 hrs, if not overnight for firmness and presentation. My family, however, could care less for presentation as long as it tastes yummy! Oh such a tasty pie! Unfortunately it never set up. Hi! I have made this before and everyone loved it ( sorry no photo)! I want to make it again but with fat-free cream cheese instead of the regular. Will this work or cause problems? Has anyone tried it with fat-free cream cheese? Wonderful flavors and consistency! My only tweet was to add a wee bit more suger, yellow food coloring and some lemon flavoring to the lemon cream. I made this for a pie social today and it was very popular! Sharing the recipe the minute I got home! Perfect for this blah long cold winter in Wisconsin. I didn't get to eat it but licking the bowls was heavenly! haha Thank you! !